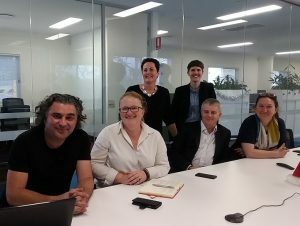 Health via art: Campbelltown arts centre director Michael Dagostino (left) and Camden and Campbelltown Hospitals general manager Alison Derrett (second left) at a meeting to discuss arts and culture in the Campbelltown Hospital redevelopment. A mix of arts and culture will play an integral role in enhancing patient care in the $632 million stage two Campbelltown Hospital redevelopment after the signing of a collaboration agreement with Campbelltown arts centre. The hospital and the arts centre will work together to create a sense of place and community through the arts which may encompass performance, arts and craft, literature and music in the new look hospital. Camden and Campbelltown Hospitals general manager Alison Derrett said the inclusion of arts and culture in the hospital’s plans would enhance everyone’s experience of health, wellbeing and cultural identity. “The collaboration with the arts centre means the broader community, including our local Aboriginal, Torres Strait Islander and Pacific Islander communities, will have input into the planning and design of the new facility,” Ms Derrett said. Campbelltown arts centre director Michael Dagostino said the centre would work with the Western Sydney University graduate research school as part of the collaboration. “Artists will provide creative solutions, with support of students through research, data and design, against five arts and culture in health themes such as changing the way people feel within a hospital and the inclusion of local Aboriginal history,’’ Mr Dagostino said. The collaboration supports the South Western Sydney Health and Arts Strategic Plan 2018 2023 and its vision that “arts and creativity move minds, bodies and spirits towards sustaining healthy lives”. The NSW Government is investing $632 million in the Campbelltown Hospital stage two redevelopment, which will include an expanded emergency department, a new intensive care unit, upgraded maternity, paediatric, mental health, cancer and surgical services and enhanced diagnostic services, including more medical imaging equipment. The 2018-19 budget for South Western Sydney Local Health District is $1.9 billion, an increase of $85.8 million on the 2016-17 budget.